The Samsung Chromebook Pro and the Acer R13 are considered mid-range Chromebooks as far as the pricing goes. With mid-range Chromebooks, you obviously get mid-range hardware, a semi decent display, and fantastic portability. When you’re picking out a Chromebook, it can be difficult choosing between the Samsung Chromebook Pro and the Acer R13. Both are great for portability, and some might find the Acer R13 more specifically appealing because of its MacBook-esque design, while others might prefer the jet black color of the Samsung Chromebook Pro. These Chromebooks are not only two completely different Chromebooks in design, but in hardware, display, and functionality, too. The Samsung Chromebook Pro was designed more for work, whereas the Acer R13 was designed more towards the general public. Samsung’s Chromebook Pro is a little sturdier in the chassis as well, which will make it more resilient to drops and accidents. So, which one do you get? Follow along below — we’ll compare the two Chromebooks and show you which one comes out with the batter hardware! First, we have the Samsung Chromebook Pro. It has a sleek, jet black design. It’s fairly low profile, so the keyboard takes up the full width of the chassis, except for maybe an inch, so you do have a small border around it. You have the touchpad up front. Mostly, Samsung designed the Chromebook Pro for using in tablet-mode. You can use the touchscreen with your fingers to navigate around and do different tasks, but Samsung includes a stylus for the Chromebook Pro — this makes it easier to sketch, write notes and even conduct presentations with the device. Furthering it’s business-focus, Samsung even includes a software suite that brings with it a variety of apps to use — all pre-loaded on the Chromebook, of course. The hardware package is really good, too. Samsung uses an Intel Celeron M3 processor in the Chromebook Pro, so things are going to be responsive and snappy. It sits at a normal speed of 0.9GHz (since Chrome OS is Linux based, it doesn’t take much power to run), but you can overclock it up to 2.2GHz. With it, you get 4GB of RAM and 32GB of flash storage space. The best part of this device might actually be its screen. It might be fairly small at 12-3-inches, but you get a super detailed resolution that is set at 2,400 x 1,600, the same resolution found on the Google Pixelbook — one thing’s for certain: you won’t be missing any detail in your movies or TV shows. Coincidentally, this makes the laptop quite useful for photo editing inside one of the Chrome OS or Android apps you can download. At $500, it’s a pretty good package you’re getting here. 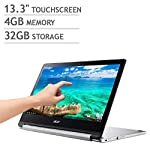 Now, you have the Acer R13. It has a MacBook Pro-esque design, although not made out of the same material, so it’s fairly cheap looking and cheap feeling. However, the silver color is a lot better than the white Acer went for in generations past. Hardware-wise, you don’t get a great package. Keeping the lights on is a MediaTek MT8173 processor backed by 4GB of RAM. The Intel Celeron M3 is far better in the Samsung Chromebook Pro here; however, it does have the same amount of flash storage — a whole 32GB. With your purchase (of any Chromebook), you do get 100GB of Google Drive space given to you. 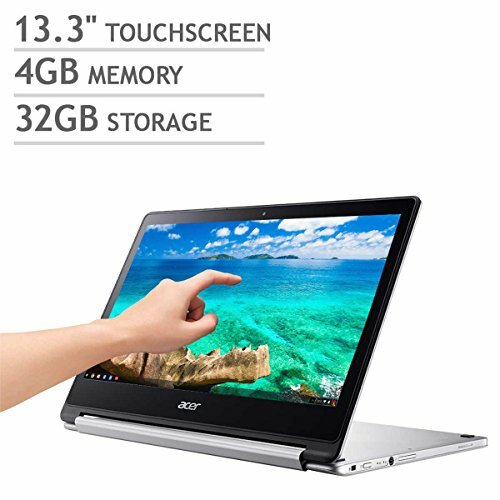 Much like the Samsung Chromebook Pro, the place where the Acer R13 excels is in its display. It has a 13.3-inch touchscreen that sits on a 360-degree hinge. That means that you can easily transform it into a tablet at any point, although the R13 feels made for more the laptop mode than anything. The resolution is slightly less than the Chromebook Pro at just 1,920 x 1,080. It’s Full HD, so you’ll still get detailed experiences in movies, TV shows, regular video and photo editing. The battery in the Acer R13 is quite nice — a single charge will give you up to a full 12 hours of use, which is great for portability — perfect for travelers or those that are always on the go. So, which Chromebook do you buy? 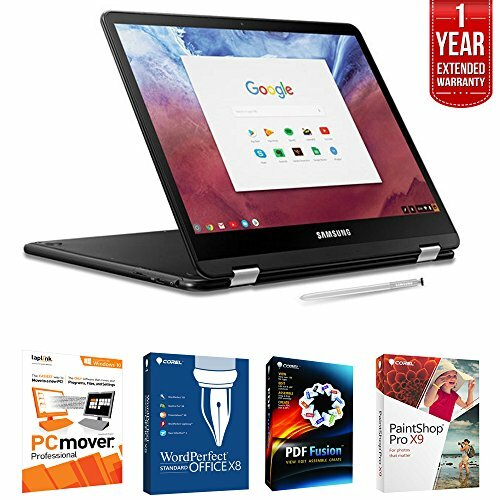 If you’re looking for value for money, the Samsung Chromebook Pro is the way to go. Both the Acer R13 and Chromebook Pro sit at the same price, and the Chromebook Pro has some noticeable advantages. So, you will get more for your money here. For example, you get a slightly smaller, but much more detailed display. You get a faster and better processing package, a stylus and even a software suite for all of your business-related apps, too. You can’t go wrong with the Samsung Chromebook Pro.